I’ve been working on Don Quixote for over a month (five weeks to be exact). It is a little longer than I’ve been spending on books since I started taking the train to and from work every day. Having that daily hour and change of pure reading time means I plow through books in a hurry. I alternate fiction with non fiction and the non-fiction business type books are done in less than a week. Don Quixote was different. I read an ancient and well-loved “abridged” translation by Walter Starkie. Even abridged its over 400 pages of single spaced type all the way to the very margins. It was slow to chew through but I thoroughly enjoyed it. I’m very glad I wasn’t assigned this in high school or in college because I would have hated it. I didn’t have patience to wade through a slow book for the delayed gratification of the Knight of the Rueful Figure trying to spank Sancho Panza. Also I would highly recommend reading the Starkie translation and abridgment. Even though I haven’t and won’t read other translations to compare I found Starkie’s footnotes to give a lot of context to the jokes that don’t make sense 400 years out of context. Reportedly the full Don Quixote of La Mancha has lots of side stories where the milk maid comes in and gives tells her life story and wanders out and other diversions that aren’t even that interesting. 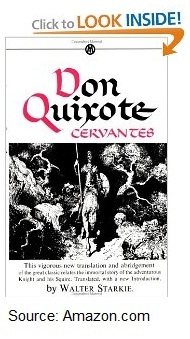 I’m glad to not have read them because there is not going to be a Smarterer test on ancillary Quixote characters. Next up on the reading list is Scorecasting which I was interested in from the plugs on the Freakonomics blog. Stay tuned.